Synopsis: In the DMZ separating North and South Korea, two North Korean soldiers have been killed, supposedly by one South Korean soldier. JSA starts off quite badly, with a confusing scenario that director Chan-wook Park seems in no hurry to explain, and some poor acting from a number of English-speaking international actors, all of which makes the first half-hour or so a little off-putting. But, once the military investigation into the death of two North Korean soldiers moves aside to allow the story to focus on the growing friendship between the four men, the whole thing improves immeasurably, and grows stronger with each passing scene until concluding with a wonderfully realised final shot that superbly summarises both the odds against which the men’s friendship is formed and the tragedy that results from it. By contrasting the similarities between the four men with the conflicting ideologies of their native lands, the film neatly encapsulates the components of one nation at war with itself. The adversarial relationship between the two halves of the country — and its ultimate pointlessness — are reduced to the harmless adversarial games and banter enjoyed by the men. 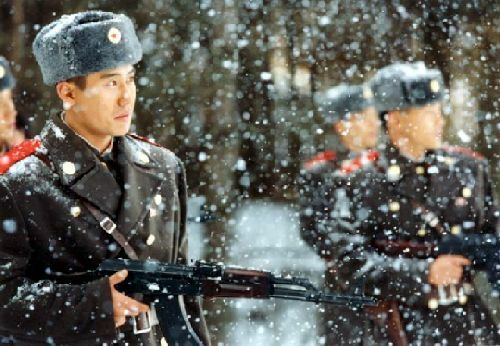 Park makes intelligent use of the camera throughout the film, resorting to visual trickery at times, but without becoming self-indulgent, and the four men are all completely convincing in their roles, although it is Kang-ho Song who stands out as the wise North Korean sergeant who loves his country while fully understanding its flaws. The mystery within the plot, while a convenient device for framing the men’s illicit friendship, unfortunately tends to overshadow the story at first — misleading the viewer into believing they are perhaps watching a completely different type of film, and distracting from its wonderful subtleties. A second viewing, therefore, can only enhance the viewer’s enjoyment.